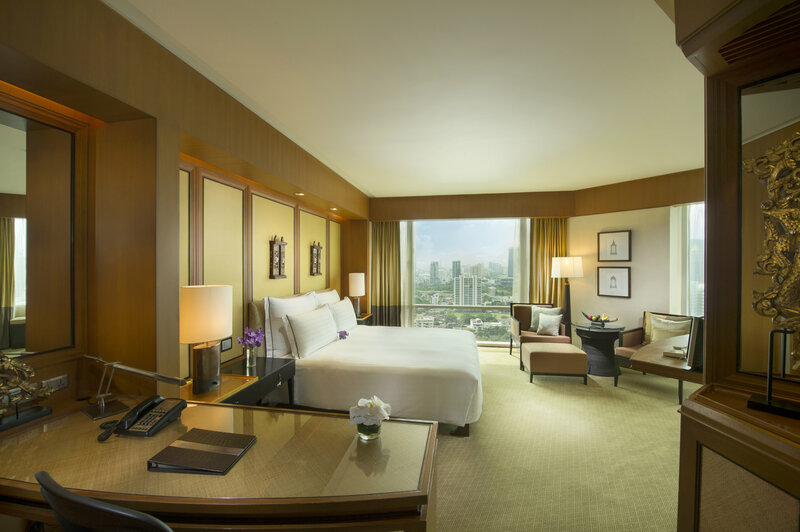 Conrad Bangkok is a multi-award winning hotel, located in the city’s major commercial center, near Siam Paragon, Central World and Central Embassy. Gourmet neo-classical Chinese restaurant, Liu tastefully combines the traditions and cultures of China with creative, contemporary interpretations of Shanghainese, Sichuan and Cantonese cuisines. 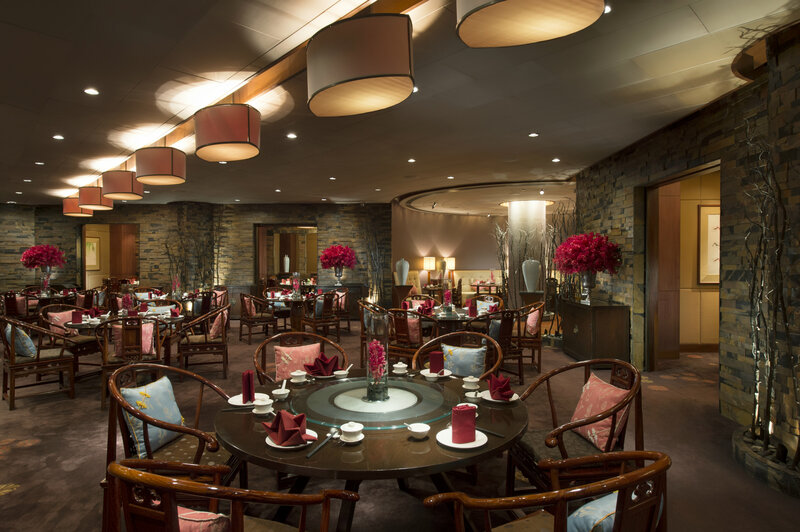 This elegantly furnished Chinese restaurant offers a selection of fresh seafood, tempting chicken and beef specialties prepared by dedicated chefs. 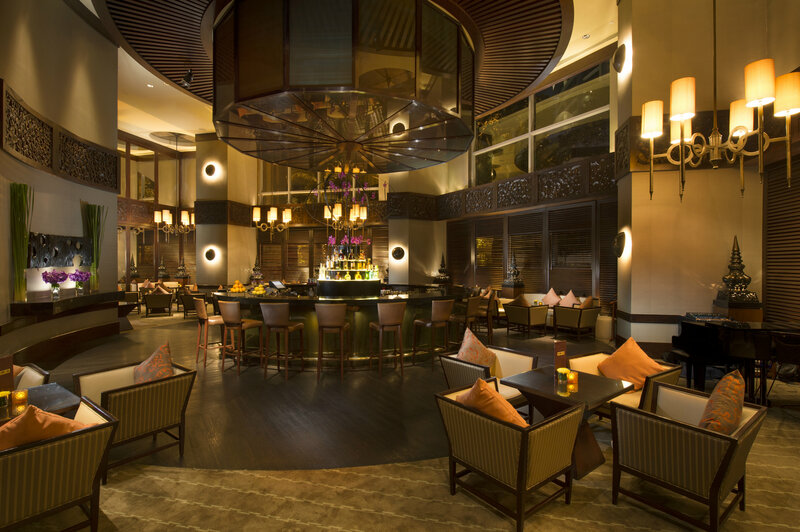 High end lounge bar offering guests a premium location for morning coffee, a light lunch, afternoon tea and evening drinking. Diplomat Bar offers no less then 16 wines by glass, and incredible array of premium cocktails and Bangkok's absolute best martini with its signature "Martini Experience". Situated on the seventh floor, this rooftop restaurant by the pool is an ideal choice for those seeking healthy light meals and snacks. The City Terrace-Pool Restaurant is open for breakfast, lunch and dinner and welcomes guest in casual attire. For Breakfast, enjoy the freshest of breads and pastries from Belgian Executive Pastry Chef Chris Busschaert. For those in search of more of an Asian feel, the buffet offers wonderful dim sum and noodles, and for the more adventurous try our braised salmon head, or chicken feet. 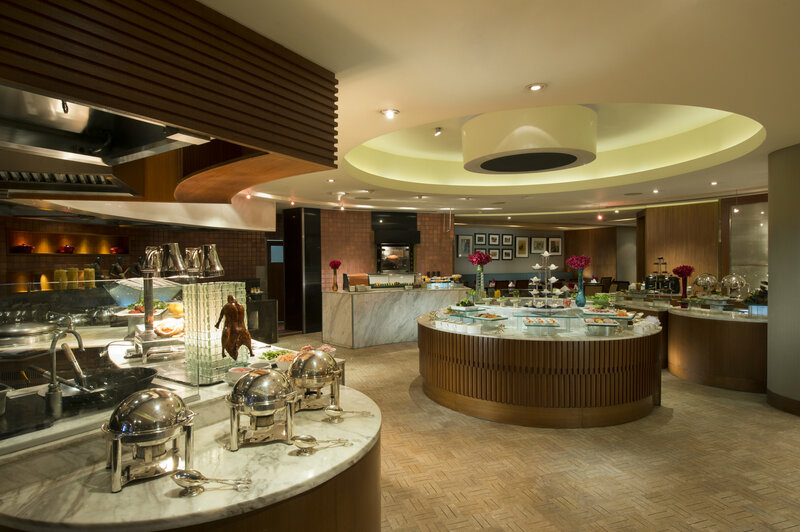 For lunch Café@2 offers a full international buffet, showcasing classic dishes from around the world. From a its range of imported itlian antipasti items, Liu's Peking duck and dim sum, sushi from KiSara, a grill section cooking items à la minute, a fresh range of fruits and salads and even an extensive array of sweets. 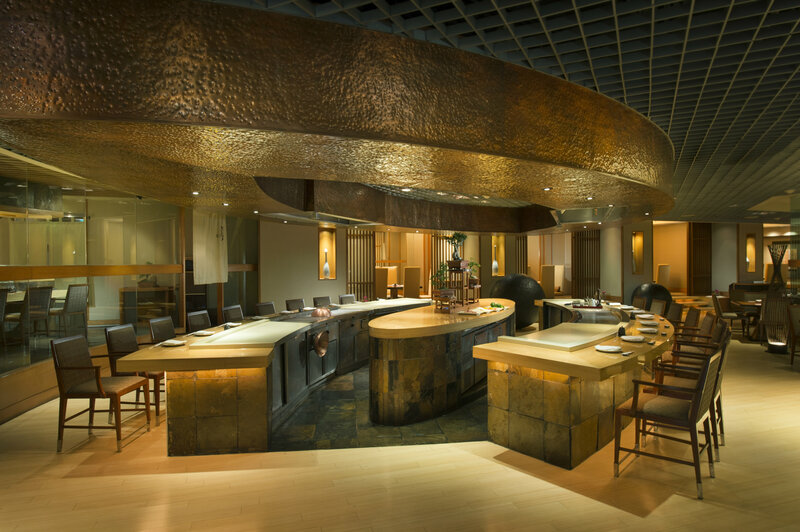 Headed by Japanese Chef De Cuisine Kenji Shindo, and Bangkok's only female Japanese Teppan Chef Masami Inoue. Together they bring in over 40 years of culinary experience to the outlet with influences from time spent in Tokyo, Hong Kong, Spain, Taiwan, France to mention a few. KiSara offers premium sushi and sashimi, the highest quality Japanese meats and seafood teppanyaki and incredible kaiseki style set menus. 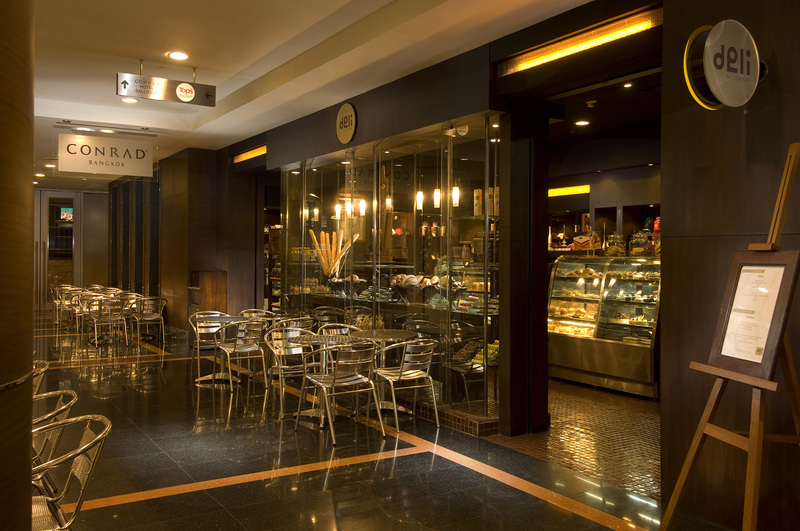 Variety of homemade sandwiches, light snacks, fruit juices, delicious cakes and tempting pastries. Discount applies to hotel operated outlets only, at participating hotels in Thailand. Taxes and service charge are not included in the discount. This certificate is non-transferable and must be presented with proof of valid membership via the Hilton Dining App. This certificate cannot be used in conjunction with any other Hilton Dining certificate or benefit, or any other special offer, discount or promotion. Twenty per cent (20%) off the following items when charge to your room account during your stay at any participating hotel: room service, laundry, mini bar, internet charges and business centre. 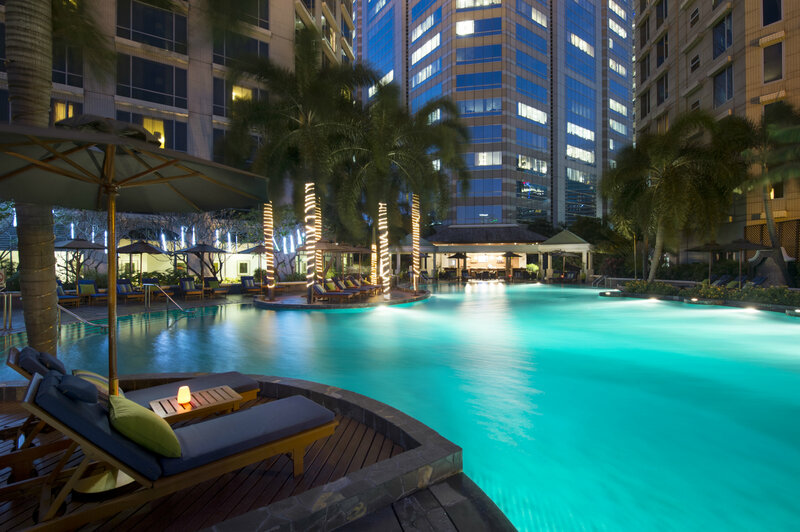 Discount applies to hotel operated facilities and services only, at participating hotels in Thailand. Taxes and service charge are not included in the discount. This certificate is non-transferable and must be presented with proof of valid membership via the Hilton Dining App. This certificate cannot be used in conjunction with any other Hilton Dining certificate, or any other special offer, discount or promotion. 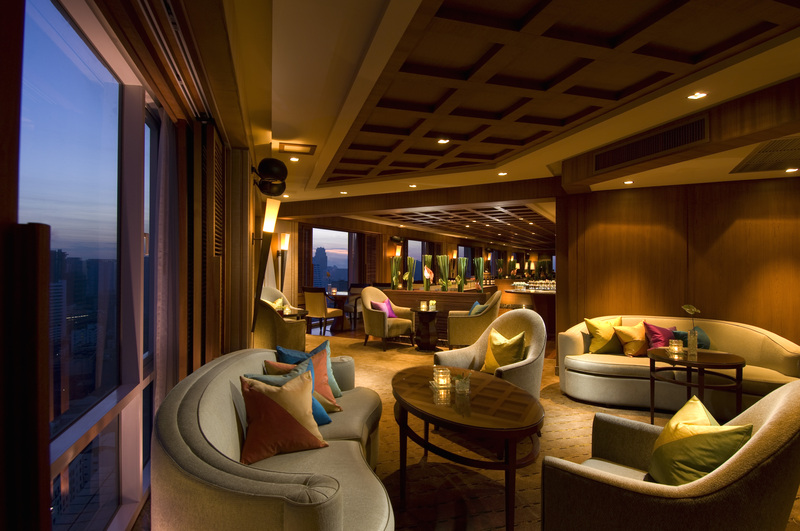 Discount applies to hotel operated facilities and services only, at participating hotels in Thailand. Taxes and service charge are not included in the discount. Advance reservations required, directly with the hotel. This certificate is non-transferable and must be presented with proof of valid membership via the Hilton Dining App. This certificate cannot be used in conjunction with any other Hilton Dining certificate or benefit, or any other special offer, discount or promotion. Discount applies to hotel operated facilities and services only, at participating hotels in Thailand. Taxes and service charge are not included in the discount. This certificate is non-transferable and must be presented with proof of valid membership via the Hilton Dining App. This certificate cannot be used in conjunction with any other Hilton Dining certificate or benefit, or any other special offer, discount or promotion. This certificate entitles the member to a complimentary one (1) night stay in a standard room (or equivalent) in the Host Hotel. Subject to availability of rooms allocated by the hotel for complimentary rate nights and must be booked at least 7 days in advance directly with the hotel. 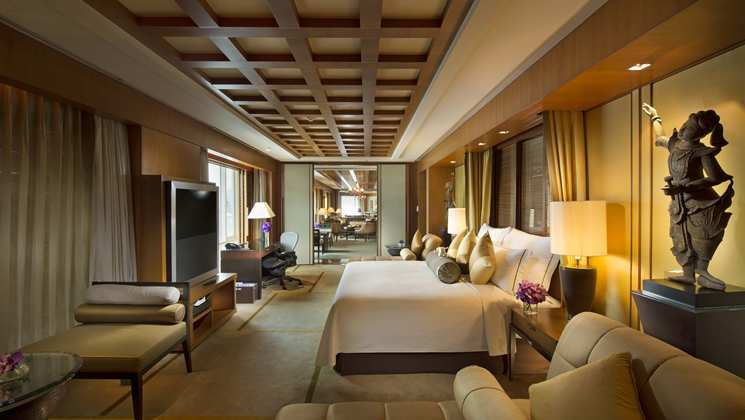 Complimentary rooms are not available during festive seasons and/or high demand periods. This certificate is valid for one room and buffet breakfast at hotel’s designated outlet for a maximum of two adults and two children below the age as specified in the general memberships terms only. This certificate must be verified upon check-in. The stay is not eligible for Hilton Honors points and airline miles. This certificate must be verified in order to receive the benefit. This certificate is non-transferable and must be presented with proof of valid membership via the Hilton Dining App. This certificate cannot be used in conjunction with any other Hilton Dining certificate or benefit (except room upgrade certificate), or any other special offer, discount or promotion. This certificate has no cash value and is non-refundable. Four (4) x THB1,000 Cash Certificates for F&B Valid at Host Hotel Only. This certificate entitles the member to a THB1,000 reduction on the total food and beverage bill, excluding applicable taxes and service charge, at participating outlets in the Host Hotel. This certificate is valid for dine-in only. Advanced reservations required, directly with the hotel. Only one certificate per reservation will be accepted. This certificate must be verified in order to receive the benefit. This certificate is non-transferable and must be presented with proof of valid membership via the Hilton Dining App. This certificate cannot be used in conjunction with any other Hilton Dining certificate or any other special offer, discount or promotion. This certificate can be used in conjunction with membership dining benefit after the value of this certificate has been deducted. This certificate has no cash value and is non-refundable. This certificate entitles the member to a complimentary lunch buffet (food only) for two (2) persons at participating outlets in the Host Hotel. (Brunch not included). This certificate is valid for dine-in only. Advance reservations required, directly with the hotel. Only one certificate per reservation will be accepted. This certificate must be verified to receive the benefit. This certificate is non-transferable and must be presented with proof of valid membership via the Hilton Dining App. This certificate cannot be used in conjunction with any other Hilton Dining certificate or any other special offer, discount or promotion. Additional diners will be accorded normal membership card dining discounts. This certificate has no cash value and is non-refundable. This certificate entitles the member to a complimentary buffet dinner or set dinner for two (2) persons at participating outlets in the Host Hotel. This certificate is valid for dine-in only. Advance reservations required, directly with the hotel. Only one certificate per reservation will be accepted. This certificate must be verified to receive the benefit. This certificate is non-transferable and must be presented with proof of valid membership via the Hilton Dining App. This certificate cannot be used in conjunction with any other Hilton Dining certificate or any other special offer, discount or promotion. Additional diners will be accorded normal membership card dining discounts. This certificate has no cash value and is non-refundable. This certificate entitles the member to thirty per cent (30%) discount for two (2) to fifteen (15) persons when dining at Cafe@2, Liu and KiSara restaurant at the Host Hotel. Taxes and service charge are not included in the discount. This certificate is valid for dine-in only. Advance reservations required, directly with the hotel. Only one certificate per reservation will be accepted. This certificate must be verified to receive the benefit. This certificate is non-transferable and must be presented with proof of valid membership via the Hilton Dining App. This certificate cannot be used in conjunction with any other Hilton Dining certificate or benefit, or any other special offer, discount or promotion. This certificate entitles the member to thirty per cent (30%) discount for two (2) to fifteen (15) persons when dining at all participating restaurants at the Host Hotel. Taxes and service charge are not included in the discount. This certificate is valid for dine-in only. Advance reservations required, directly with the hotel. Only one certificate per reservation will be accepted. This certificate must be verified to receive the benefit. This certificate is non-transferable and must be presented with proof of valid membership via the Hilton Dining App. This certificate cannot be used in conjunction with any other Hilton Dining certificate or benefit, or any other special offer, discount or promotion. This certificate entitles the member to a THB500 reduction on the total food and beverage bill, excluding applicable taxes and service charge, at participating outlets in the Host Hotel. This certificate is valid for dine-in only. Advanced reservations required, directly with the hotel. A maximum of two (2) of the same certificate per reservation will be accepted. This certificate must be verified in order to receive the benefit. This certificate is non-transferable and must be presented with proof of valid membership via the Hilton Dining App. This certificate cannot be used in conjunction with any other Hilton Dining certificate (except one other THB500 Dining Certificate), or any other special offer, discount or promotion. This certificate can be used in conjunction with membership dining benefit after the value of this certificate has been deducted. This certificate has no cash value and is non-refundable. This certificate entitles the member to a complimentary buffet lunch for one paid buffet lunch at Cafe@2 from Monday to Friday, except Thai public holidays and December 25th. This certificate is valid for dine-in only. Advanced reservations required, directly with the hotel. Only one certificate per reservation will be accepted. This certificate must be verified in order to receive the benefit. This certificate is non-transferable and must be presented with proof of valid membership via the Hilton Dining App. This certificate cannot be used in conjunction with any other Hilton Dining certificate or any other special offer, discount or promotion. Additional diners will be accorded normal membership card dining discounts. This certificate has no cash value and is non-refundable. This certificate entitles the member to receive a round of complimentary drinks up to the same value, when buying one round of drinks. Not valid during Happy Hours or on full bottle purchases. Valid for maximum twelve (12) drinks, one per person. Only valid for beer, wine and cocktails. Service of alcoholic beverages subject to applicable laws and regulations. This certificate is valid for dine-in only. Advanced reservations required, directly with the hotel. Only one certificate per reservation will be accepted. This certificate must be verified in order to receive the benefit. This certificate is non-transferable and must be presented with proof of valid membership via the Hilton Dining App. This certificate cannot be used in conjunction with any other Hilton Dining certificate or benefit, or any other special offer, discount or promotion. This certificate has no cash value and is non-refundable. This certificate entitles the member to a THB1,500 reduction on the total food and beverage bill, excluding applicable taxes and service charge, at participating outlets in the Host Hotel. This certificate is valid for dine-in only. Advanced reservations required, directly with the hotel. Only one certificate per reservation will be accepted. This certificate must be verified in order to receive the benefit. This certificate is non-transferable and must be presented with proof of valid membership via the Hilton Dining App. This certificate cannot be used in conjunction with any other Hilton Dining certificate or any other special offer, discount or promotion. This certificate can be used in conjunction with membership dining benefit after the value of this certificate has been deducted. This certificate has no cash value and is non-refundable. D. Complimentary Buffet Dinner (food only) for two (2) persons. This certificate entitles the member to a complimentary dinner buffet (food only) for two (2) persons at participating outlets in the Host Hotel. This certificate is valid for dine-in only. Advance reservations required, directly with the hotel. Only one certificate per reservation will be accepted. This certificate must be verified to receive the benefit. This certificate is non-transferable and must be presented with proof of valid membership via the Hilton Dining App. This certificate cannot be used in conjunction with any other Hilton Dining certificate or any other special offer, discount or promotion. Additional diners will be accorded normal membership card dining discounts. This certificate has no cash value and is non-refundable. This certificate entitles the member to a complimentary afternoon tea or buffet breakfast for two (2) persons (food only) at participating outlets in the Host Hotel. This certificate is valid for dine-in only. Advance reservations required, directly with the hotel. Only one certificate per reservation will be accepted. This certificate must be verified to receive the benefit. This certificate is non-transferable and must be presented with proof of valid membership via the Hilton Dining App. This certificate cannot be used in conjunction with any other Hilton Dining certificate or any other special offer, discount or promotion. Additional diners will be accorded normal membership card dining discounts. This certificate has no cash value and is non-refundable. This certificate entitles the member to thirty five per cent (35%) discount for a maximum of twelve (12) persons dining at Chinese restaurant in the Host Hotel. Taxes and service charge are not included in the discount. This certificate is valid for dine-in only. Advance reservations required, directly with the hotel. Only one certificate per reservation will be accepted. This certificate must be verified to receive the benefit. This certificate is non-transferable and must be presented with proof of valid membership via the Hilton Dining App. This certificate cannot be used in conjunction with any other Hilton Dining certificate or benefit, or any other special offer, discount or promotion. H. Buy One Get One Free Buffet or Set Meal or Afternoon Tea for 2 persons at All Day Dining restaurant or any outlets with set menu, Not valid with any other member benefit. Hotel can choose OR Afternoon Tea for 2 persons. This certificate entitles the member to a THB1,000 reduction on a minimum spend of THB2,500 on the total food and beverage bill before other discounts are applied, excluding applicable taxes and service charge, at participating outlets in the Host Hotel. This certificate is valid for dine-in only. Advanced reservations required, directly with the hotel. Only one certificate per reservation will be accepted. This certificate must be verified in order to receive the benefit. This certificate is non-transferable and must be presented with proof of valid membership via the Hilton Dining App. This certificate cannot be used in conjunction with any other Hilton Dining certificate or any other special offer, discount or promotion. This certificate can be used in conjunction with membership dining benefit after the value of this certificate has been deducted. This certificate has no cash value and is non-refundable. 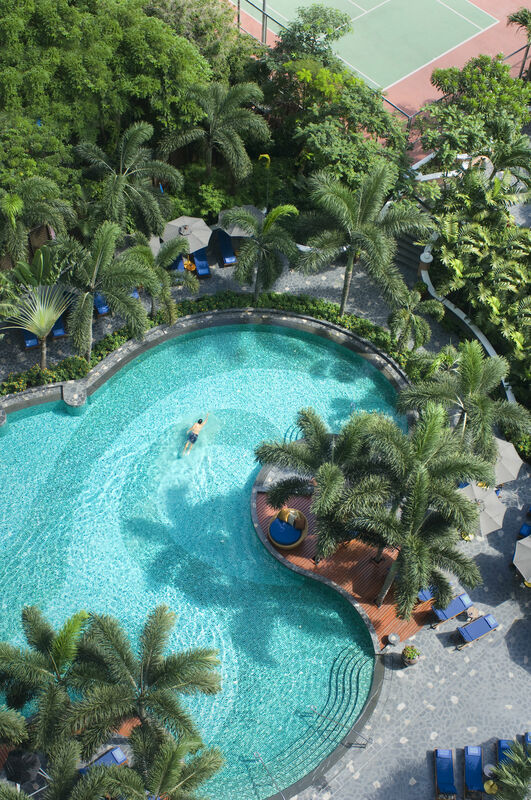 K. Gym and Pool Certificate, for one (1) time free visit to Gym and pool for 2 persons. M. Certificate for 25% off Spa treatments. This certificate entitles the member to a 25% discount on Spa treatments. Discount applies to hotel operated facilities and services only, at the Host Hotel. Taxes and service charge are not included in the discount. Advance reservations required, directly with the hotel. This certificate is non-transferable and must be presented with proof of valid membership via the Hilton Dining App. This certificate cannot be used in conjunction with any other Hilton Dining certificate or benefit, or any other special offer, discount or promotion. This certificate entitles the member to a THB1,888 (or THB1,000) reduction on the total food and beverage bill, excluding applicable taxes and service charge, at participating outlets in the Host Hotel. This certificate is valid for dine-in only. Advanced reservations required, directly with the hotel. Only one certificate per reservation will be accepted. This certificate must be verified in order to receive the benefit. This certificate is non-transferable and must be presented with proof of valid membership via the Hilton Dining App. This certificate cannot be used in conjunction with any other Hilton Dining certificate or any other special offer, discount or promotion. This certificate can be used in conjunction with membership dining benefit after the value of this certificate has been deducted. This certificate has no cash value and is non-refundable. One (1) x Certificate for a Complimentary Buffet Lunch for two persons (Brunch not included) for each such friend who purchases a membership. Upon submission of the names of a minimum five (5) contacts to be solicited for potential membership, member shall receive, for each such contact who purchases a membership, one (1) certificate for a complimentary buffet lunch for two (2) persons at participating outlets in the Host Hotel. (Brunch not included). This certificate is valid for dine-in only. Advance reservations required, directly with the hotel. Only one certificate per reservation will be accepted. This certificate must be verified to receive the benefit. This certificate is non-transferable and must be presented with proof of valid membership via the Hilton Dining App. This certificate cannot be used in conjunction with any other Hilton Dining certificate or any other special offer, discount or promotion. Additional diners will be accorded normal membership card dining discounts. This certificate has no cash value and is non-refundable. This certificate is valid for new members only, not valid for any person who has been a member within the past twenty four (24) months from date of membership purchase.